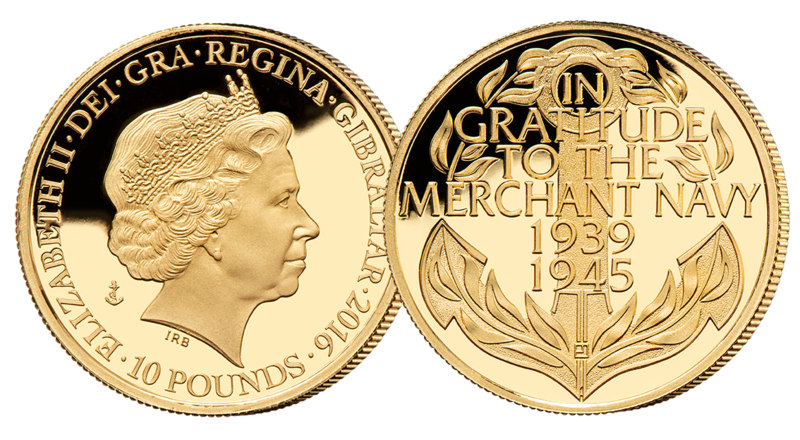 A stunning tribute to our WWII merchant seafarers minted in 99.9% gold! The London Mint Office have taken the opportunity to commemorate the Battle of Atlantic and the men that went out without question to sustain their country throughout the bleakest of times with the Battle of Atlantic Gold Coin. Struck in pure 24 carat gold and to the highest possible quality, proof standard, this coin is issued in gratitude to our war soldiers from the Battle of The Atlantic - the longest, hardest and most complex battle of the Second World War. The obverse carries the Merchant Navy Mint Mark that will never appear on another product outside of the Battle of Atlantic range. This coin struck in 99.9% pure gold will remain an everlasting tribute to the 185,000 British and Commonwealth merchant seamen who volunteered to stand up unarmed against an all-powerful enemy, and the 30,000 British seafarers that made the ultimate sacrifice during the Battle of the Atlantic. The Merchant Navy is often referred to as the ‘Fourth Service’, but it has also become the forgotten service, with the huge contribution of the merchant fleet during the war too often overlooked and undervalued. The thousands of merchant seafarers who made up the ‘Fourth Service’ during the war are our ‘unsung heroes’ – their heroism and the sacrifices largely unreported and uncelebrated. The London Mint Office is proud to change this. All sales of this gold coin are endorsed by, and help fund donations to, The Merchant Navy Association.